The fact that we can be whisked through the air from Los Angeles to Chicago in three hours is a modern miracle, but much must be endured during that time. As on most flights, there are babies or very young children that are generally very unhappy about flying with of its restrictions of space. On our flight is a child with a piercing scream that fills the plane with the power of its voice. The wailing is like an ice pick being driven into my ear. Of course, the child is expressing what we all feel about flying’s discomfort. If we didn’t possess adult inhibitions, we would all be shrieking. We are packed into incredibly small spaces with people we don’t know, then further pinned down with a tight seat belt. The back of the seat in front of me is only inches away, and, if the person in the seat tilts it back, it is even closer, almost to my nose it seems. We’re in the back of the plane, so I look through the cabin at all those heads. When we hit turbulence, all heads loll around in unison with the motion, all looking comically like bobble heads. I try to relax as we hurtle through the air at 600 miles per hour, streaking over the deserts, the Rockies and the Middle West’s patchwork of farms. We are enveloped in the soft roar of the aircraft, a kind of white noise similar to the sound of traffic on the freeway. At last we lower into the traffic pattern of Chicago’s busy O’Hare Airport, bumping and tossing through cumulus clouds on the way down. We join the dizzying throngs in the terminal, hundreds of people walking every which way toting backpacks or rolling luggage behind them. We pick up our bags, then walk outside the terminal to meet our tour leader. We are soon on a bus with others, marveling at the magnificent skyline of Chicago. We move slowly through the busy city streets, at last arriving at our hotel, the Crown Plaza. After a delicious buffet dinner and the fatigue of our trip, our rooms are especially inviting. We look forward to a good night’s sleep. Refreshed in the morning, I step outside to check the weather, the sky clear and the air crisp at around 40 degrees. It is early May, and the trees are just beginning to leaf out. Today we begin a whirlwind tour of Chicago. Carl Sandberg called Chicago “the city of big shoulders,” and that’s what it is, big. Our bus winds through Chicago’s busy streets, among the skyscrapers. We look up at the towering Sears Building, then the impressive Citibank Center. We pass over the gray Chicago River flowing through the center of the city and watch a silver elevated train roar by above us. 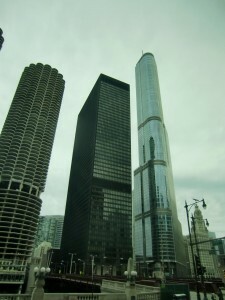 The Chicago Board of Trade and the Federal Center are other huge buildings that make up downtown. In contrast to the buildings, we come upon a fifty foot sculpture by Alexander Calder, a brilliant red structure he called “Flamingo.” It looks nothing like a flamingo, but its glaring red color is a relief from the gray drabness of the buildings. We pause at another work of art that graces the downtown area, a long, free-standing mural by Marc Chagall, depicting the four seasons. Even more art is found only a few blocks away, another fifty foot tall sculpture that looks like a tall, metallic abstract angel with great metal wings. This one is by Pablo Picasso, and to this day is untitled. The sculpture flares out the bottom, a fact noticed by several children who are using that part of it for a slide. 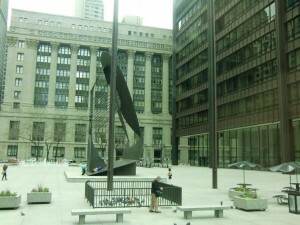 Near the Picasso sculpture is an eternal flame dedicated to John F. Kennedy. Around this flame are a dozen pigeons huddled close to the flame to keep warm on the chilly morning. 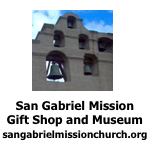 Nearby is the “Corncob’ building, a tall structure looking like its name, used to park cars on its many levels. It is strange to see all the cars peeking out of the openings. Not far away is the Trump building with his name spelled out in huge letters. 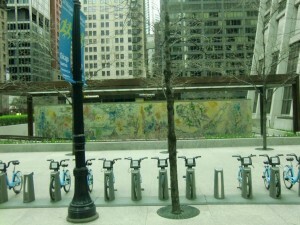 Some Chicagoans object to this, claiming that it spoils the décor of downtown. Moving toward the south of the city, we pass the old but modernized Soldier Field where the Chicago Bears football team plays. Just south of the field the city opens up into its cultural area, home of the Museum of Natural History, the Shedd Aquarium and the Adler Planetarium. Earlier, in the city, we had passed the Chicago Art Museum, one if the finest in the world. To me, Chicago is one of the cultural capitals of the United States. 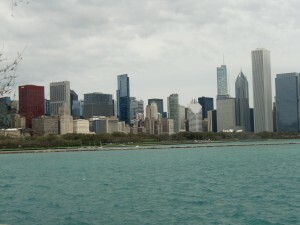 We stop briefly near the marina on Lake Michigan where we can look back on the stunning skyline of this great city. A cold wind blows off of the water, billowing the hair of some of the young women and scattering the seagulls. More about this wonderful city in the next article. From a bus window we look at Marc Chagall's mural depicting the four seasons. Note the rental bikes in the foregound. A side view of Picasso's sculpture. Note the kids sliding on the base and pigeons warming themselves on Kennedy's eternal flame in the foreground. The magnificent skyline of the great city of Chicago. At left is the "corn cob" building with the lower portion used for parking. goodbye doll” But I miss it. The men were handsome, mixtures of Polish, German Italians.One never has a good hair day, the famous lake wind ruins your set. I will go back one day before winter comes, I never miss that time of the year.